Portrait Restaurant, 3rd floor, Ondaatje Wing, National Portrait Gallery, St Martin's Place, London WC2H 0HE. +44 20 7312 2490. Just off Trafalgar Square. Rooftop restaurant boasting spectacular views over London. Daily Breakfast:10am-11.15am. Daily Lunch 11.45am-2.45pm. Daily Afternoon Tea: 3.30pm-5pm. Thurs, Fri & Sat Dinner 5.30pm-8.15pm. Pre Theatre: Thurs, Fri & Sat 5.30pm-6.30pm. L'Atelier de Joel Robuchon, 13-15 West Street, Leicester Square, London WC2H 9NQ. +44 20 7010 8600. The Paramount, 32nd floor, Centre Point, 101 New Oxford Street London, WC1A 1DD. +44 20 7420 2900. The restaurant offers fantastic views, as far as Windsor Castle. Mon to Wed 8am-1.30am. Thurs & Fri 8am-2.30am. Sat 11.30am-2.30am. Sun 12 noon-4pm. 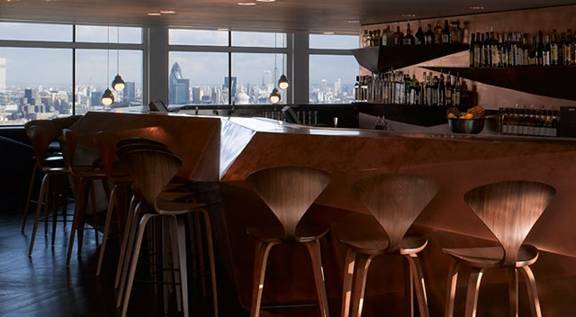 Also head up to the Viewing Gallery and Bar on the 33rd floor for 360 degree views. 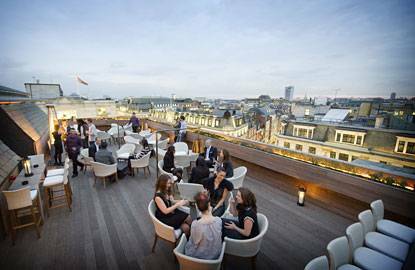 Radio Rooftop Bar, 10th floor, ME London, 336-337 The Strand, London WC2R 1HA. 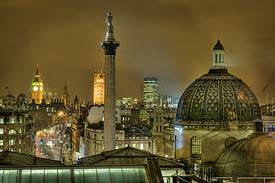 +44 44 845 601 8980 Rooftop bar with panoramic views of Central London. Mon to Wed 12 noon–1am. Thurs to Sat 12 noon–3am. Sun 12 noon–12 midnight. 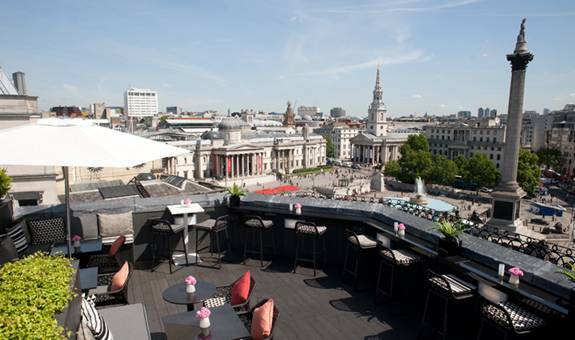 Amphi Al Fresco Restaurant, Royal Opera House, Bow Street, Covent Garden, London WC2E 9DD. +44 20 7240 1200 View over the Piazza. Rooftop Cafe, Selfridges & Co, 400 Oxford Street, London W1A 1AB. The rooftop garden is complete with a bright green lake for row boats. Aqua Kyoto, 5th Floor, 240 Regent Street, (Entrance at 30 Argyll Street), London, W1B 3BR. +44 207 478 0540 Opposite The London Palladium. Open Mon to Sat 12 noon-3pm. 6.30pm-1am. 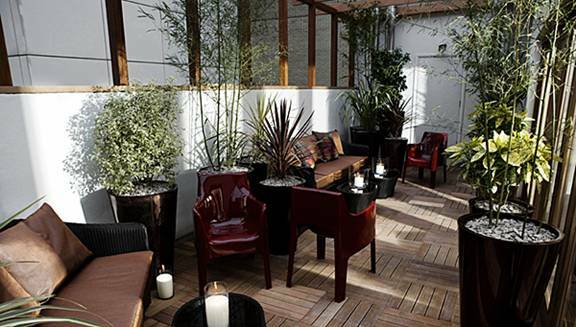 Rooftop Bar, Sanctum Soho Hotel, 20 Warwick Street, Soho, London W1B 5NF. 24 hour residents' rooftop bar. Century Club Roofgarden, 61 Shaftesbury Ave, Soho, London, W1D 6LG. +44 20 7534 3080. 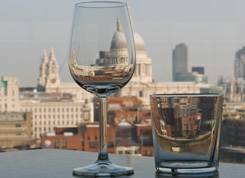 Soho Sky Terrace, Courthouse Doubletree by Hilton London-Regent Street, 19 Great Marlborough Street, London W1F 7HL. +44 20 7297 5555. Tues to Sat 3pm-10.30pm. Minako at the Met, 23rd Floor, Hilton London Metropole, 225 Edgware Road, Marylebone, London, W2 1JU. +44 20 7402 4141 Discover an oasis of calm in this 23th-floor Asian fusion restaurant with breathtaking views of the London skyline and the River Thames. 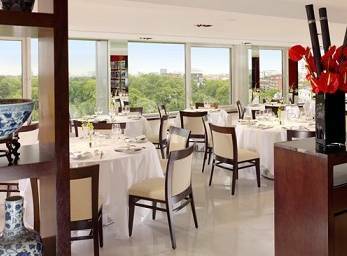 Min Jiang Restaurant, 10th floor, Royal Garden Hotel, 2-24 Kensington High Street, London W8 4PT. +44 20 7937 8000. Spectacular views over Kensington Palace and Hyde Park. Rockwell Bar and Restaurant,Trafalgar Hotel, 2 Spring Gardens, Trafalgar Square, London SW1 A2TS. +44 20 7870 2900. May be closed for private parties. Arguably the best-located rooftop bar in the capital. Hilton. Vista at the Trafalgar, Trafalgar Hotel, 2 Spring Gardens, Trafalgar Square, London SW1a 2TS. +44 20 7870 2900. Altitude, 29th Floor, Millbank Tower, 21-24 Millbank, London, SW1P 4QP. +44 20 7592 7908 Panoramic views from on high. 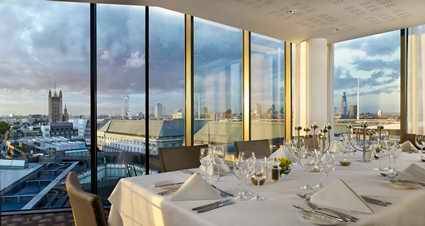 Altitude London provides five floors of versatile event spaces and unlimited experiences at Millbank Tower in the heart of London. Top Floor Restaurant, Smiths of Smithfield, 67-77 Charterhouse Street, London EC1M 6HJ. +44 20 7251 7950. Mon-Fri Lunch 12 Noon-3pm. Mon- Sat Dinner 6pm-11pm. Great views. Angler Restaurant and Roof Terrace, South Place Hotel, 3 South Place, London EC2M 2AF. +44 20 3503 0000 Seafood with city views. Sushisamba London, 37th, 38th and 40th floors, Heron Tower, 110 Bishopsgate, London EC2N 4AY. +44 203 640 7330 Magnificent views of the Gerkin and the river. Close to Liverpool Street Tube Station. Sun to Thurs 11.30am–12 midnight. Fri & Sat 11.30am–2am. 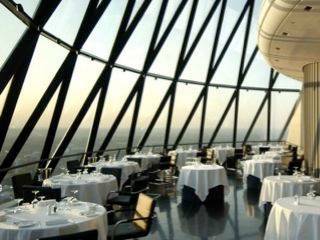 40/30 Restaurant and Bar, The Gherkin Tower, 30 St. Mary Axe, London EC3A 8EP. +44 207 585 0505. +44 207 101 0220. A two level restaurant and bar. Breathtaking uninterrupted 360 degree views of the city from 180 metres up. Event hire friendly so check access. Tube: Circle, Hammersmith and city, and Central. Queen of Hoxton Rooftop Bar and Kitchen, 1-5 Curtain Road, London EC2A 3JX. +44 20 7422 0958 Daily 12 noon-10pm weather permitting. Film nights. SkyLounge Rooftop Bar and garden, 14th floor, DoubleTree by Hilton London-Tower of London, 7 Pepys Street, London EC3N 4AF. +44 207 709 1000 Hovering above the hotel's roof, sits the cantilevered Sky Lounge. This separate metallic element, set above the surrounding rooflines, contains a penthouse bar and links to external roof terraces which include herb gardens, green roofs and incredible 360º views of London. Ideally positioned in the heart of The City it has been specifically designed to engage with the London skyline offering spectacular views over Tower Bridge, the historic Tower of London and the river Thames, and the Gherkin and St Paul's from the North Terrace. 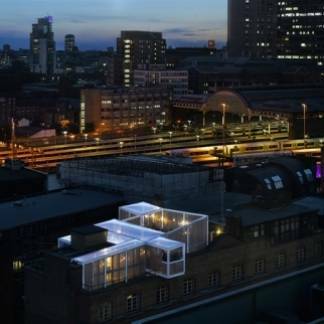 Shoreditch House Rooftop, Ebor Street, London E1 6AW. +44 20 7739 5040. 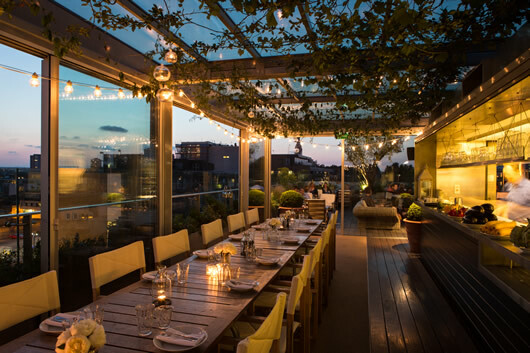 The Shoreditch House is an extremely cool private club located in trendsetting East London. The House is on a few levels each offering something different. 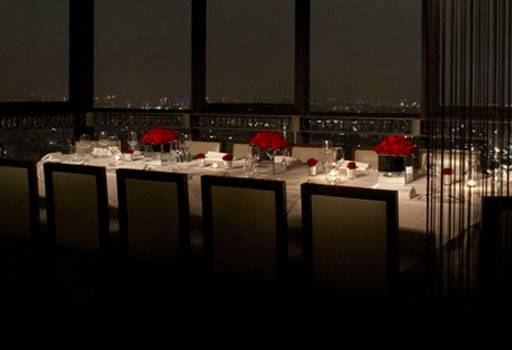 There are dining rooms, bars, jars of free candy, and of course, the rooftop lounge, where members can eat and drink. Outside the lounge is an open-air swimming pool. Members only. The MacBeth, 70 Hoxton Street, London N1 6LP. +44 20 7749 0600. Music events. Coppa Bar Hothouse Rooftop, Access via Martello Street (railway arch end), London E8 3QW. 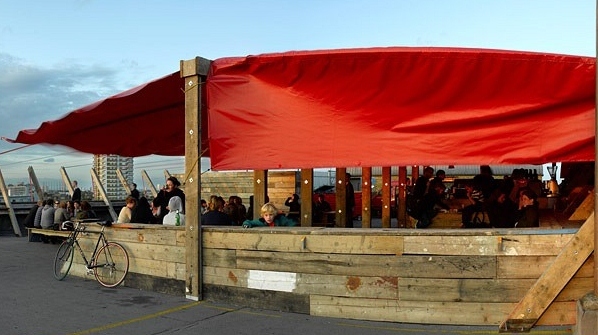 +44 20 8985 2683 A summertime rooftop Italian restaurant overlooking London Fields with lots of little bathing shacks. Friday from 5pm. Sat& Sun 12 noon. 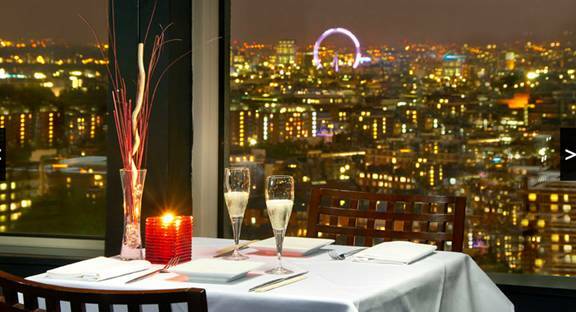 Plateau Restaurant, 4th floor, Canary Wharf, Tower Hamlets, Canada Place, London, E14 5ER. With dramatic views across the rooftops of Canary Wharf and futuristic décor, Plateau is a stunning, light-filled restaurant. All the glamour of Manhattan and the buzz of a big city by day while at night the lights dim to offer a more intimate experience. Espresso Bar, Level 4, Tate Modern, Bankside, SE1 9TG, City-South. With two riverside balconies, the Espresso Bar serves drinks, sandwiches and snacks. Sun to Thurs 10am–5.30pm. Fri & Sat 10am–9.30pm. Roast, The Floral Hall, Stoney Street, Borough Market, London, SE1 1TL. +44 845 034 7300 Sun 11.30am-6pm. Mon to Fri 7am-10.30pm. Sat 8am-10.30pm. Top of BM with market views. Dim T, (London Bridge), 2 More London Place (off Tooley Street), London, SE1 2JP. +44 20 7403 7000 Great Tower of London views. Gaucho, 2 More London Place, Southwark, London, SE1 2JP. +44 20 7407 5222 Great Tower of London views. Blueprint Cafe, Butlers Wharf, 28 Shad Thames, Bermondsey, London, SE1 2YG. +44 20 7378 7031 The Design Museum is right on the river, and the second-floor restaurant features an all-glass north-facing wall with a view of the Tower Bridge, the Tower of London and the City. Spectacular view of the Thames. 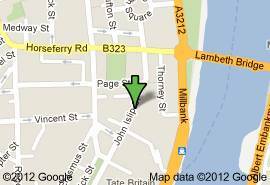 The Sky Room, Fifth floor, Magdalen House, 136-148 Tooley St, London SE1 2TU. Unique new structure with a balcony cantilevered over Tooley Street offers breathtaking views through the More London Development to the Thames and the Tower of London beyond. Fully licensed bar and removable roof. Tube: London Bridge Cannon St Monument. Rail: London Bridge Cannon St. Bus: 17, 21, 35, 40, 43, 47, 48, 133, 141, 149, 343, 381, 521, RV1. For hire for events. Skylon, 3rd floor, Royal Festival Hall, Southbank Centre, Belvedere Road, SE1 8X 020. City-South. +44 20 7654 7800. Skylon is a stunningly decorated restaurant & bar complex. An enviable location that comes complete with floor-to-ceiling windows. Queen Elizabeth Hall Roof Garden, Southbank House, Black Prince Rd, London SE1 8XT. 0844 875 0073 Southbank Centre's winter garden roof grotto. The rooftop cafe is serving mulled wine and winter snacks and the garden is the ideal antidote to the busy market down on the Queen's Walk. Oxo Tower Restaurant Bar & Brasserie, 8th floor, Oxo Tower Wharf, Bargehouse St. London SE1. +44 20 7803 3888. A very pleasant (if very pricey) venue sums up the current form of the posher half of the Oxo experience, where you get a splendid eighth-floor view of the Thames & St Paul’s from a riverside location on the south bank of the Thames. You’ll be able to see most of central London weather permitting. Try to get a table on the patio. Trafalgar Tavern, Park Row Greenwich, London, SE10 9NW. +44 20 8858 2909 FOOD: Mon to Thurs 12 noon-10pm. Fri & Sat 12 noon-10pm. Sun 12 noon-4pm. BAR: Mon to Thurs 12 noon-11pm. Fri & Sat 12 noon-12 midnight. Sun 12 noon-10.30pm. Frank's Cafe & Campari Bar, 10TH floor, Peckham Multi-Story Carpark, 95A Rye Lane, London SE15 4ST. +44 758 288 4574 Thurs to Sun 11am–10pm. Food served 12 noon-2.30pm. 6pm-10pm. The Black Cap, 171 Camden High Street, London NW1 7JY. +44 20 7428 2721 Rooftop Terrace at back (with heaters). Gay ambience. Transport: Camden Town. Mornington Crescent. Mon to Wed 12 noon-2am. Thurs to Sat 12 noon-3am. Sun 12 noon-1am. The Sky Bar, Sheraton Skyline Hotel, Heathrow Airport, Bath Road, Hayes, England UB3 5BP. +44 208 759 2535. Come rain or come shine the glass roof at The Sky Bar will allow people to dine in the warmth, within the surroundings of exotic plants and overlooking the hotel's swimming pool. Sun to Thurs 4pm-11pm. Fri to Sat 4pm-12midnight. Starwood.